The BlindSpotz technology of CTI (Chromatic Technologies Inc.) is helping stop product tampering by inventing the first dual-indicator to detect product tampering from heat and freezing. The use of extreme temperatures (especially sub-zero temperatures) to circumvent traditional security measures on packaging has increased substantially among criminals in recent years, with no effective deterrent until now. To date, most tamper indicators only reveal heat tampering (such as using a heat gun to melt glue on packaging tape). BlindSpotz ‘Tamper Freeze’ and ‘Tamper Heat’ inks show color and messaging when thieves use heat OR cold to tamper with packages. The long-time industry standard has been a ‘high-heat’ tamper indicator that changes color, but now there’s a tool to fight bad actors who use cold spray, freezing or liquid nitrogen to pull apart a money or document bag and remove and replace an expired label or bypass security tape–treated, high-heat irreversible inks. “The BlindSpotz ‘Tamper Heat and Tamper Freeze’ inks eliminate both threats,” Small continued. 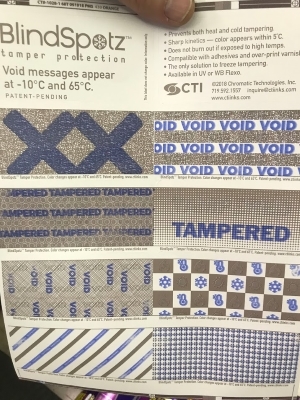 CTI’s ‘Tamper Freeze’ ink is the only tamper-evident product on the market to identify sub-freezing tampering. The ‘Tamper Heat and Tamper Freeze’ inks are part of the BlindSpotz technology portfolio from CTI developed to print sensors on-pack to measure temperature compliance, confirm high pressure processing (HPP) pasteurization and detect tampering or water damage. With a history dating back to the late 1890s, the effects of product tampering have been staggering. The most infamous case of product tampering is the Tylenol crisis of 1982, in which seven Chicago-area people died after taking what they thought was extra-strength Tylenol but was in fact potassium cyanide. The case is still unsolved. One man was later convicted of extortion, but no one was convicted of the murders. This event led to new requirements for tamper-evident seals on over-the-counter medications and changes in US tampering laws. Sadly, product tampering worldwide has continued: in September 2018, sewing needles were found inside strawberries in six of Australia’s seven states. In January 2018, metal pins were found in grocery store food in Offenburg, Germany, and in September 2017, jars of baby food in Friedrichshafen, Germany, were laced with ethylene glycol (the sweet-tasting compound used in antifreeze). The year 2016 saw deadly baked sweets containing a potent pesticide kill more than 30 people in Pakistan’s Punjab province following a family argument. And in 2003, Italian supermarkets were on high alert for several months when “The Aquabomber” used a syringe to contaminate water bottles with bleach and acetone. Over a dozen people became sick after drinking the tainted water. Counterfeiting and piracy are estimated to have a global economic value reaching US $2.3 trillion by 2022. Estimates on the wider social and economic impacts on displaced economic activity, investment, public fiscal losses and criminal enforcement could reach an estimated US $1.9 trillion by 2022. Combined, the negative impacts of counterfeiting and piracy are projected to drain US $4.2 trillion from the global economy and put 5.4 million legitimate jobs at risk by 2022. Protecting products against counterfeiting and tampering is a weighty worldwide concern. In fact, by some estimates, counterfeit goods account for between 5-7 percent of all world trade, reaching an annual value of over $250 billion at present. All types of products—including pharmaceuticals, auto parts, toys, software, vintage wines, artwork, airplane parts and consumer goods—are falling victim to some form of counterfeiting. CTI is the world’s largest producer of thermochromic ink and manufactures other environmentally reactive technology, such as photochromic, pressure activated, irreversible, reveal and glow-in-the dark. CTI is an innovation company that supports the world’s biggest brands and package printers.